I often have conversations with my family about what I’m doing in school and get the idea from them that they think what I’m accomplishing is “exceptional” in some way. I always have a rough time seeing this. I mean, I am daily surrounded by people doing the exact same things as me, often far exceeding my ability to do them. So no, I don’t see reading three books a week, while also writing four responses and grading fifty essays as anything but “normal.” It takes getting outside of your box to see a bigger picture. While I understand this concept, I still get surprised every time someone remarks that I’m “so brave” for having gone to Lebanon. I can only interpret this phrase in one of two ways: one, that people really think it takes bravery to go to a place perceived to be unsafe, or two, that they really mean that I’m “such an idiot.” I honestly don’t think either are true, but then again, this might be like the school situation in general – maybe I’m just too far into my world to realize the bigger picture. Does it take “bravery” to realize that much of the world is “unsafe” and to decide to be a citizen of it anyways? Most of the things that make “other places” unsafe is a lack of understanding of cultural practices. Not-knowing = fear = unsafe. Were there parts of Beirut that felt less safe than others? Of course. Are some parts of South Baltimore less safe than Pasadena, MD? Um, yes. Do you make the mental choice when walking down the street to hold your purse on the not-street side of the sidewalk so it’s less likely to be snatched? You surely do. All major cities have these rules. Are there parts of Lebanon I had no business being in? Absolutely. Which is why I didn’t go. Being brave in this instance really just means being a little bit savvy. I really believe that. But maybe, I only do because I really am “such an idiot.” I way over-packed for this trip to Lebanon, mostly because I wanted to be sure I had everything I needed for every situation we encountered. I had an hijab in my purse at all times, not because I was afraid, but because I understood that it was possible we might randomly stop at a mosque, and I probably would need something to cover my hair. This isn’t bravery—it’s common sense. Common sense that only goes from doing your research beforehand and getting to know the place you’re going. Obviously, Syria is right next door to Lebanon, and going near a war zone is probably not the best idea if you have no reason (or no training) to be there. So we didn’t get near the northern border of Lebanon. And yes, the State Department does have a travel warning on Lebanon, (at the time I went) not because of problems in Lebanon itself but the possibility of problems in areas surrounding. There are travel warnings on many of the nations US citizens regularly travel to, Israel being one of the most common, so a travel warning isn’t an automatic decisionmaker. In the end, it comes down to doing your research and weighing your options. Was it more likely that something “bad” would happen to me in Beirut than Blacksburg? Probably. Was it likely that something “bad” would happen to me at all in Lebanon? Less than you would think. The LRF and NCUSAR prepared us in the days and weeks before the trip on what to expect. Everyone on the trip had experience studying the Middle East prior to the trip. While in Lebanon, we had guides and hosts whose top priority was to keep us safe. If it was unsafe for us to be someplace, we didn’t go. For instance, there was initially a day trip planned to Tripoli. We decided mid-trip that this was an unsafe option, and we didn’t go. I really don’t think going on this trip confirms my bravery in any way. This isn’t the word to describe it at all. I understand that most people who use this word to describe me are really saying something about themselves more than me – that they think it takes bravery to go to Lebanon. As part of my fellowship, it is my goal to dispel some of these fears – to explain to others why the experience of other people’s cultures and traditions is exciting, not something that requires bravery. 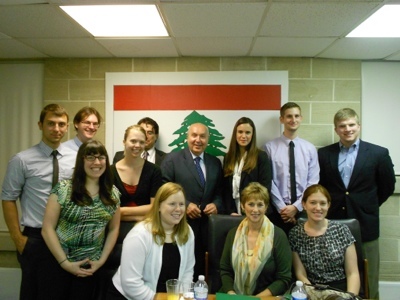 On June 29, the LSF met with Simon Abi Ramia, President of Youth & Sports Committee of the parliament of Lebanon. Our discussion was widespread, focusing on sports and youth (of course) but also on politics, religion, and society within Lebanon. His insight touched upon many of the national and regional issues currently in play in Lebanon. My 110+ wpm typing speed meant I was able to take transcript-level notes of this meeting, and with Abi Ramia’s kind permission, I am now able to share it with you. I think this is a great insight into exactly what kinds of meetings we had. If you would, could you please talk about the recent programs you’ve put forth, namely the Outdoor Lebanon and the National Youth Policy? AR – There is a difference between the Ministry and the Youth Committee in Lebanon. We have the government and under it we have the Committee of Youth and Sports. The Committee’s mission is to make laws and also to examine the work of the government. One of our greatest problems is that the Youth and Sports Committee is not considered very important in Lebanon; it is considered a secondary ministry. I have tried since becoming chairman of this committee to increase this committee’s importance in Lebanon. As ministers, we cannot only speak about politics and not be interested in the youth policy and sports. I think that sports are something that can federate our cities beyond politics and religion. In Lebanon, we have a very small budget for this ministry – about 2-3 million USD. This is the salary of a football player in France for one month, perhaps [laughs]. The budget of the same ministry in France is about 1 billion USD per year. We only have 2 or 3 million to give as donations to clubs and sports federations. If you want to have a good policy and the ability to assure follow-up on programs, you have to give money to this ministry. Currently, we are working on some targets. For example, in Europe they have youth cards – with them, you can have a reductions in entertainment and public activities to get the youth involved. We need this sort of ID for youth here. We are hoping that it will be launched in September. You have to know also that in Lebanon, youth cannot vote if they are not 21 years old. In other countries, it’s about 18. In Scandinavian countries, they are working to give this right to vote to 16-year-olds. Along with my colleagues, I presented a proposal of law one month ago that would lower the voting age. I think this is necessary because, for example, in order to found an organization or NGO in Lebanon, you must be 20 years old. You cannot officially be a member of an organization in Lebanon if you are not 20. I proposed that this age be lowered to 18 years old. It’s a first step in allowing our youth to be able to vote when reach 18. And also, and this proposal I suggested would allow people between 15 and 18 to be a member, but not a director, of an association or NGOs. For example, they would be able to assist to the meetings. I think it’s a good step for youth, because in Lebanon, the political age of maturity is 21 years, so now, I think we can work on it. Also, our committee adopted a document. Since 2000, many NGOs work together with youth to know what the problems of youth in Lebanon are. For example, these problems include access to property and housing, health problems – many youth are not covered by health programs, nor do they have access to transportation to go to their universities and schools. We now have 120 recommendations by this youth forum before the Ministry. And, in our committee, we are working to propose laws to answer to the youth’s needs. Has this committee been consulting with NGOS? AR – Yes, so we can propose them through laws. It is very important because before, we didn’t work on the youth problems. I think it’s a good committee. It will take time, because it is Lebanon. It is a good beginning. If I am reelected in one year, I will follow up this mission. We have also the other part in our committee, the sports. We are working to propose many laws to promote sports in Lebanon. We have many individual competencies, but we do not have a unified policy. We are working on it with other committees. You know we have many political problems in Lebanon. Two years ago, I organized a football match between all the ministers of parliament (MP) and ministers from all parties, on the 13th of April, the beginning of the war in 1975. It was, I think, a good initiative. I wanted to give a message that we can have political differences, but we can play together; we can have social relations together. In Lebanon, we have a big problem. We speak about democracy without using it on a daily basis. If I speak with another party, you can find some guys from my own party who criticize my attitude with them, asking why I’m speaking with an enemy. I tried by this match, especially for youth, to send a message that we can have differences between us, we can be from different parties, but we can have social relations. We can play together. There is a challenge for employment among the youth. What is the parliament in general and your committee specifically doing to build employment opportunities for youth and young people in Lebanon? AR – I was in Cyprus last week, and every morning, I read the newspapers in English because I was preparing for this meeting and having to speak in English [laughs]. We have a big problem. We cannot speak about unemployment problems if we do not have a global policy for youth and for Lebanon. In Lebanon, when you look at the statistics, we have only 25 percent of youth that automatically get jobs after university. In Lebanon, we have four million people in the country and you have 12 million in the diaspora. Lebanon is a small country, and we do not have a lot of natural resources that can give jobs to youth. We have to work on this. I’ll give you an example. Last year, we worked with the former Minister of Labor on a law. When a company or society hires a new graduate, they do not have to pay taxes to the state on this employee for a year, and gradually, the taxes will increase for two years. Two years after the employee is hired, the company will pay taxes as they would for other employees. Thus, we can give more incentives to companies to have youth work for them. But it’s not the only solution. You know, we have to have a general policy. In Lebanon 40 years ago, when we earned our bachelor’s, we wanted to be a lawyer or an engineer or doctor. Nobody wanted to do other things. So now, we’ve started to see different careers for students, but our government must have a policy for students in sectors where they can find work. The other problem is that we do not have resources—our country is poor. I don’t mean in individuals; I’m speaking about resources. For example, Lebanon has 20 billion USD in revenue, and we spend 20 billion. This 20 billion is just to pay the interest on our public debt and to pay the salaries of public employees. We don’t have money for infrastructure for this reason. When we want to build some infrastructure and other kind of projects, we have to find a country or NGO to help us. So, we have a structural problem. It needs a global policy. Right now, we don’t have it. In several of our meetings, they have discussed that the private sector is interested in being involved with infrastructure, with the possibility of privatization. What are your thoughts? AR – I am with them, and I think for example with electricity, we are going to have a partnership between public and private sectors. Not only in electricity, but in many other sectors as well. I think that Lebanese public money is not enough for Lebanon. We need private investment as well. I do not think our government is against this idea. How would you overcome some of the political obstacles to achieve this partnership? AR – For electricity, we have a law in Lebanon that only the state produces electricity and distributes it. We have to change this law. Now we are working on it to allow private investors to become partners in producing and distributing electricity. The Ministry has contact with three private companies and service providers. It’s a beginning, this public-private partnership (PPP), and it needs to happen. We cannot privatize all our energy sectors, but I think that we are moving for a partnership between public and private investment in Lebanon in many sectors. As an MP, how do you engage with your constituency? 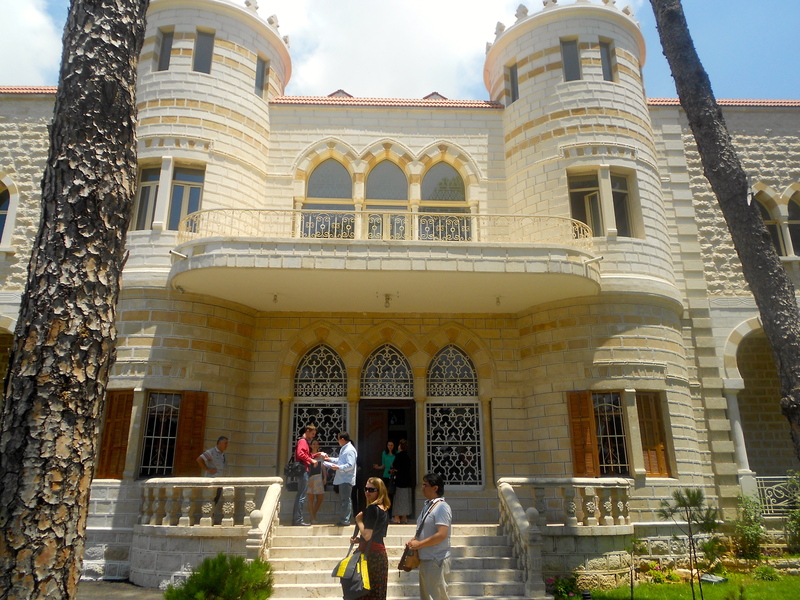 AR – I am the MP of Byblos (Jbeil). In Beirut, I am not very far from my area. When there is no traffic, it is 30 minutes away. The work of the MPs in Lebanon is not like other countries. I spend 80% of my time with citizens, because we do not have a good administration. You can have a citizen wait for electricity in his home for a year or three. The MPs are the link between citizens and administration. We have a lot of corruption in Lebanon. When you have your rights, your actual demands, you have to pay someone working in the public administration. I go two afternoons per week to my office in Jbeil from 4 p.m. to 8-10 p.m., and I receive people in my office. I take their requests and follow up with my team. I really have no weekends with my family, because there is a difference between being a MP of Beirut and the coasts and the MPs of the mountains. When I am in my village on the weekends, where there are only 1200 people, when I wake up at 7 a.m., people from many villages at my home to give me their requests. You can be sure that I have good contact with citizens in my constituencies. Yesterday, I attended four funerals. Today, I have three. On the weekend, I attend 6 or 7 weddings, so we spend a lot of time on this kind of social obligations. When I was elected, I had been in France for 23 years. I have many French MP friends. When I was elected, I decided to not be like other Lebanese MPs. I was very criticized for not going to weddings/baptisms/etc. So now, I do it. I have a Lebanese friend in America for 45 years, married to an American woman. He lost his mother in Jbeil this year and had lost his mother-in-law six months before in the states. For his mother-in-law, there were only six people in the church, and he received three texts, two letters, and maybe four or five calls. When he was here for his mother’s funeral, in the three days after the funeral, he was visited 1000 people – this tells you the importance of the social relations. There’s a big difference between your cultural system and the Lebanese system. Because I spent more time in France than Lebanon, it was difficult to adapt. You had devastating Civil War that lasted almost a generation. I am curious to understand how the youth understand the Civil War and what the narrative is for them. Has something been learned? How are the youth perceiving what happened and why it happened? Is the new generation going to view their country and their allegiances differently? And, if so, how? What are the mechanisms in place? AR – I will try to be very honest and clear. The problem in Lebanon that we never try to be independent and to live our independence. Many political forces here are still receiving orders from and have connections with other regional countries. I think that we never had a natural state, because many Lebanese citizens believe we gained our independence from international decisions. The people of Lebanon know the names of all the foreign ambassadors in the country, but they do not know the MPs for their area. When we invite foreign ambassadors to our home, we are proud to display to our neighbors that we had a foreign ambassador at home yesterday. Our mentality is not independent. The future of Lebanon is not decided by the Lebanese citizens, but rather by regional, political, and international decision makers. I think that is the reason of our civil war. I can spend many hours speaking about this. To be clear, you have a big community in our country, the Shi’a community: they are in permanent connection with sponsor, Iran. And you have the Sunni citizens in permanent connection the Saudis. And they have freedom of movement in Lebanon. When they speak about foreign policy, it is dominated by the policy of their sponsors. And also, we have another problem in that we follow our community more than our national citizenship. First of all, I am Maronite, Christian, and Lebanese and not Lebanese, Christian, and Maronite. This is a big problem because this is the reality. If I want to be an MP and I am a Maronite, I have to find a Maronite seat in the country to be MP. Our system is made to put you in this kind of mindset. And I think that the political leaders of Lebanon, they are very happy with this system, because they can always have hegemony in their communities. For example, if you are Maronite and you want a post in the administration, you cannot be there solely on your competence. You must have the blessing of your political leader and your community leaders, and then you can be in your position in the administration. Perhaps I didn’t answer your question about youth now… Our problem is that we do not have a common discourse about the beginning of the war. The former Minister of Education, he tried to have a common history book that you learn in the schools. In Lebanon, for two years, we tried to have this book. We didn’t succeed because of many interpretations of all persons sitting around the table making decision about this book. Everyone is offending each other, and I think that because of this, we never made a judgment about the civil war in Lebanon. I mean, I am a Christian. If I think that Christian leaders made some errors in the war, I can think about it but I cannot say it, because I have always to defend my community. This is a big problem – we are still caught in this sectarian system. Can you expand a discussion of the bloc you are associated with in parliament (the Change and Reform Bloc)? AR – We have many blocs, and we have 17 committees in parliament. In each committee, you have some MPs from our bloc. I am the chairman of this committee, and I can be a member in one other. I am also a member of the committee of ecology and the environment. When we have problems about these two issues, I can be involved. When people speak with me about other problems, I see them in these committees to follow up. When we are discussing legislation, we have a meeting per week, and we speak in our meetings about laws in the parliament and also about the political issues also. It takes time, you know. If you ask me if I’m very happy in what I’m doing, I can tell you no, because it’s not the way that I pictured it. We have many obstacles in Lebanon. When we want to reform, it is very difficult because of religious obstacles and generational divides. It is very complicated, our country, but I have to push forward to make some reforms. If I can make some new laws for youth, it will be a good beginning. When we have no government, we have to wait for eight months, nine months, one year to create a new government. It is very complicated. For this reason, what you can do in the States in one day takes one year in Lebanon. It is very consensual here because of religious implications. Is your term ending 2013? And do you plan to run again or retire? AR – I will continue. First of all, my party will decide who will run in my area. I think I have done a good job as MP, and I think I can do more than I am doing now. When I speak about my frustration, it is to tell you that I do not think that I am alone in thinking this. We have many MPs in our parliament, especially youth in different parties. We want to make something different for our country. We can make huge reforms, but it is very very difficult. For this reason, I will be the candidate in one year. This doesn’t mean I am not very satisfied with my work. It is not my fault; it is the fault of the system. Returning back to sports, I know that now, for many women in the Muslim world, the Islamic Women’s Games are their only option for competition. Do you see things changing for women? AR – It’s a big problem in the Arab society, the veil. First of all, in Lebanon, you have many women champions, and they will represent Lebanon in London in one month. I am proud to say that we have many female Lebanese athletes from Lebanon for the Olympic games. Recently in Lebanon, we had a problem with internal national security because the first time that 30-40% of women are wearing the veil, and we are not like other countries. It’s a big problem, and you know when you start to speak about God and not scientific things, it is difficult to change your ideas, so I don’t have an answer for you. For Lebanon, for example, we will never see an athlete representing Lebanon with a veil. I cannot speak about other countries. My problem now is that we are assisting all these Arab revolutions, and I was expecting a dream – we work for democracy, human rights, pluralism, and I am discovering that we are going backwards with the Islamic Brotherhood, so I have many questions about the future of this region. In Lebanon, 30 years ago, you couldn’t find a woman with a veil. Now, you go to the south Beirut suburbs, Baalbek, Tripoli, and you will find it. And also, when you go to all Arab countries now, you find it. It’s a big problem. It’s not only a sports problem – it’s a big problem. I am afraid for the future, because this is a phenomenon that is becoming more prevalent in our society. Do you have any programs getting more women in the government? AR – We don’t have this kind of program. When I spoke about the law I proposed, it is a way to motivate youth to go to assist. All our political parties are built as simple associations. In this way, I can encourage motivation in the youth to build and be a member of these political associations. We don’t have other programs now. In Lebanon, generally, all people are political. They are not waiting for us to give them motivation to get into political activity; they are already motivated. Could you share with us what thoughts you may have and what you wish to impart to us to take back to the US about Lebanon? AR – I need a conference [to discuss all my ideas]! First of all, I think that you cannot have an idea about Lebanon from TV; you must come here, you must be in contact with the Lebanese people to begin to understand our problems. Now, you are meeting me. In an hour, you’ll meet someone else and have another approach to the political problems in our country and in the region. Second, I think that when you make this kind of trip here, you can learn and you can get more information about our real problems. Lebanon is not like any other Arab country – I want you to know that we have a specificity here that we are living in. Lebanon is not a democracy, but we have elections, we have a president. You cannot find this system in other Arab countries. Also, I think that you have to understand that I don’t like to speak of confessions and religious issues, but there is a problem, especially for Christians, because of radical Islam within Sunni and Shi’a. For this reason, why I spoke of how 30 years ago, you’d never find a hijab. Now you can find it everywhere. It means that we are afraid (as a Christian person) not only in Lebanon but for the entire region, and I think that it’s the most important problem – how to interact with Islam in this country and also in this region. We can write poems… but concretely, we are living with this problem. I think that, for example, in the US, you [the US administration] forget that there are Christians here. The US administration has only two targets: petrol and Israel. For this reason, I think there is a miscommunication between the Lebanese and the American administration. The American administration must integrate in its political culture that we cannot defend human values by preaching and speeches. We have many questions about the policy of the US. Your public opinion doesn’t understand the problem here. In France, there are 577 MPs. I’m sure that only 50 MPs understand the problem of this region. 500 are not able to tell you where Lebanon even is. Perhaps, they can mix up Lebanon with Libya or Iran. At the same time, you are leading the world—US and Europe—so I hope in your visit you can get the real problems of our country. I know you cannot change American policy. If there is someone on the beach watching to the other person drown… you cannot just tell them what to do instead of pulling them out. Transcriber’s note: I have not changed the content of this meeting in any way, other than to clean it up for spelling and grammar. I really loved the way Abi Ramia spoke, so I have attempted to keep his cadence and words intact. Sitting at Dulles, 9:13 PM EDT. Thought I’d get some thoughts down from today’s orientation at the National Council on US-Arab Relations. It was a truly excellent day. The Council provided us the opportunity to speak with many individuals from all sides the US-Lebanese relationship. Meetings included a trip to the Lebanese Embassy, a meeting at Al Arabiya, a representative from the State Department, an individual from the Lebanon Renaissance Foundation (our co-sponsors), and other experts from the area. It was incredibly awesome to reconnect with Josh, Dr. Anthony, and out of nowhere Mark, who had been the National Council Rep for MAL when I was a student, as well as a fellow Chief Justice of the ACJ. I have been connected with this organization since 2004, and I swear, I doubt I’ll ever *not* be involved with these programs. There were so many themes woven throughout today, but the phrase I heard more often than not was that Lebanon is “a country of contractions.” In the same country, there are Shia, Sunni, Maronites, Roman Catholics, Jews, Druze; moderates, liberals, conservatives… All jumbled together in a democratically elected, Confessional government. It’s mindblowing. My own research tends to look at personal status law, namely marriage, in Palestine and Israel. I had been wondering how much I would be able to look at this issue being in Lebanon, but judging form some of our conversations today, it seems that there will be a wealth of information in country. I found it interesting that several of our speakers believed that Hezbollah is the most powerful non-state actor in the world. I suppose that makes a lot of sense, but I’d honestly never thought about it before. Hezbollah has a stronger military and far more missiles and weapons than many state militaries. And yet, Hezbollah’s popularity has gone way down since 2006, given their current support of Syria. Speaking of Syria, another conversation turned to the role of the Arab League should any of the violence in Syria escalate or cause issues in Lebanon. The Arab League has changed dramatically in the last 18 months, for instance sending monitors into Syria from other Arab nations. For any of us who have done Model Arab League, the word “sovereignty” gets thrown around, you know that this is a big step for the Arab League. So the AL definitely has the ability to step in in some capacity, should Syria escalate further, based on this precedent. Then again, given the absolute slaughter that has happened so far in Syria, and given that the Charter of the League allows for the protection of all Arab people, the AL can easily have a leading role in the future. So all-in-all, it was a wonderful, informative day. I have a cohort of fellow travelers that seem like so much fun, and I honestly can’t wait to stuff my face with Lebanese food. 9:58 PM EDT now. Boarding at 10:20; flying at 11:25. Insha’Allah, we will have a wonderful flight! I’ll try to check in in Istanbul (layover). Otherwise, hellllooooooooo Beirut! Wednesday, I’ll head into DC to stay with my lovely friends J and B. Thursday is orientation, followed by my flight on Turkish Airlines at 11:30 PM EST. I’m kind of nervous, but mostly in a “not knowing what to expect” kind of way. Packing was a new adventure in “omg I need this and this and this!” I do hope I have everything I need. Sometime between now and Wednesday, I need to finish reading House of Stone. I’ll post my thoughts later. I started this blog because it seemed like every class in my life last semester had some sort of requirement about it. Now, with no assignments, I found my voice was gone. Do I really have nothing to say? A month from now, insha’Allah, I will be in Beirut on a Lebanon Summer Fellowship (cultural immersion/travel) sponsored by the National Council on US-Arab Relations. My goal is to blog the entirety of the trip, from the pre-planning through my year following my return. Part of the fellowship is that we share the knowledge we gain over our 10 days in Lebanon with our communities. Well, with a blog, my community is anyone. A few comments. VT’s WordPress site does not work well on the iPad. Creating links is a nightmare. Edits are equally problematic. I am using a Logitech keyboard I just got off Amazon to update this, and so far I really like it. It is my goal to be constantly blogging and updating Twitter while I’m there. Follow my hashtags on Twitter (#lebanon2012, #LSF2012) to keep up with me in real-ish time. To be 100% honest, though, I may have to migrate to official WordPress if this is going to work. This lack of editing could be a problem.